Egg PancakesMix together; batter will be thin. Cook on a hot griddle spray with cooking spray or coat with some oil. Pancakes will be thin. Crunchy Mixed Veggie BakePreheat oven to 350 degrees F. In medium bowl, combine soup, mayonnaise, garlic and pepper; mix well. Stir in cheese. Place vegetable blend in greased 9x13 inch baking pan. Creamy Peas with Ham and OnionMelt butter in large skillet over medium-high heat. Add ham and cook until browned, about 5 minutes. Add onion and cook until soft and beginning to brown, about 5 minutes. Add cream, tarragon, and salt and pepper to taste. Bunny Rabbit PancakesBunny pancakes are microwave easy! The kids are going to love this. Buttery Herb LoafPreheat oven to 350 degrees F. In small bowl, combine butter, onion, basil, oregano and parsley. Separate rolls. Add to butter mixture; turn over to coat both sides. Creamy Chicken And NoodlesIn a skillet, quickly golden brown each side of chicken breasts. 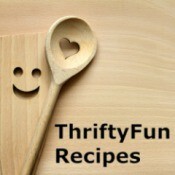 Then, including chicken, combine first 4 ingredients in a Slow Cooker. Marshmallow Easter EggsEaster is almost here and these marshmallow eggs are a fun recipe to make with your kids or to bring to an Easter party. 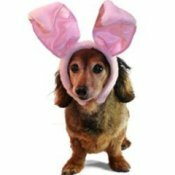 Easter Hazards for PetsHere's a list of Easter items that may be harmful to your pets. Chocolate: It contains theobromine. The Theobromine in chocolate can cause vomiting, diarrhea, hyperactivity, irregular heartbeat, seizures and, in some cases, death to cats, dogs and other small pets. 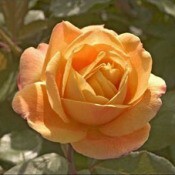 All-American Rose Selections for 2007Founded in 1938, the All-American Rose Selections (AARS) is a non-profit association made up of rose producers and growers dedicated to introducing and promoting exceptional roses to the gardening public. 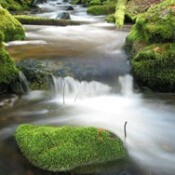 Tips For Growing Moss on RocksTips for getting moss to grow on rocks and planters in your yard. Post your own techniques here. Aromatherapy For The House!I make my own aromatherapy by using a tea kettle, making sure it is always filled with water. Great for humidity. Add spices, such as, cloves, cinnamon, nutmeg, allspice, pumpkin pie spice, apple pie spice, orange rind, lemon rind. 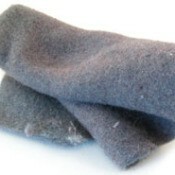 Uses for Dryer LintDryer lint is an expensive commodity. It represents the life being worn from your clothes by the action and heat of the dryer. I know that's why I won't dry anything of mine any more. I get it out and hang it up to dry or put it on the line. Place Small Phone Book In CarOur phone company delivers both large and small phone books when new ones are published. I put the smaller one under my car seat and use it to look up phone numbers when I'm out. Tito, Katie, Billy and Bobby (Parakeets)Tito, is on the top, Katie is hanging on the side, Billy and Bobby (handicapped) inside. 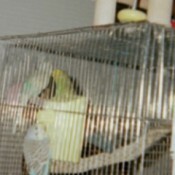 They are all Parakeets and are rescue pets. All less than 3 years old. Isn't that sad? Thrown away so young. I got them at different times over the last few years. 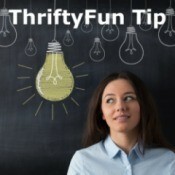 Saving Money on Garden Supplies and EquipmentHere are some money saving tips on gardening equipment and supplies from the ThriftyFun community. Post your own here. Frugal Tips For PromI just was in an upscale thrift shop and if I had been looking for a prom dress, there were several long formal gowns there for $20! Remember there are often deals on formal dresses! Make Wraps for a Quick DinnerWhen you don't have enough time to cook healthy but don't want fast food, make my specialty dinner combo. Just take a roll or a wrap and add your favorite veggies, fruit, and meat. 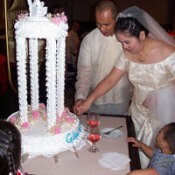 Wedding Cake TipDon't forget to reserve a small cup cake for kids. Find Basic First Aid Tips OnlineDo you know you can get first aid tips through the internet? I swallowed something and then consulted the net and found out that the item was small enough so the doctors couldn't do anything but wait until it passed through me. Decorate Shoe Boxes For StorageSave old shoe boxes and paint them to match your decor. You can have your children paint them with fun designs and notes. 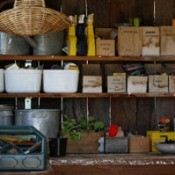 Either way, they look great and they are much cheaper compared to store bought boxes and baskets. Sewing Machine Keeps JammingMy sewing machine keeps jamming, down in the bobbin area. It won't sew even an inch. I look and see extra thread jammed down there by the bobbin, and have to yank it all out and start over, but it keeps jamming. Activity Ideas for Visiting ParentsI am in need of some ideas of what to do with my mom and her husband when they come to visit. My family loves the outdoors and they would rather sit and read the paper or watch TV. We have games but also a 2 year old so we are limited on things to do. Drop Shipping AdviceDoes anyone know anything about drop shipping? 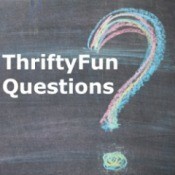 I want to find a place that will allow me to dropship their products after selling them on ebay. My husband is having a hard time making the bills and I am disabled and would like to contribute as much as possible. Knitting SocksWould anyone who is a knitter, have any suggestions for knitting socks; books, tips or patterns. I have recently started to get back into knitting, it has been a few years, and through several moves have lost most of my knitting patterns.